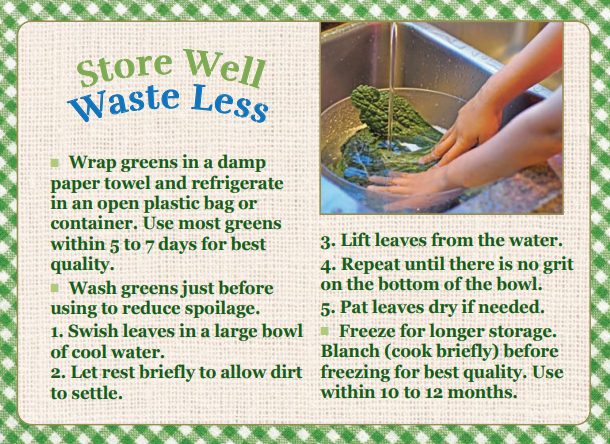 ■ Wrap greens in a damp paper towel and refrigerate in an open plastic bag or container. Use most greens within 5 to 7 days for best quality. ■ Wash greens just before using to reduce spoilage. 1. Swish leaves in a large bowl of cool water. 2. Let rest briefly to allow dirt to settle. 3. Lift leaves from the water. 4. Repeat until there is no grit on the bottom of the bowl. 5. Pat leaves dry if needed. Freeze for longer storage. Blanch (cook briefly) before freezing for best quality. Use within 10 to 12 months.